Thrombotic complications associated with peripherally inserted central catheters (PICCs) are common, as most synthetic materials when placed in the presence of serum often result in platelet activation, fibrin deposition, thrombotic occlusion, and potentially embolization. A current innovation focus has been the development of antithrombogenic catheter materials, including hydrophilic and hydrophobic surfaces. This review focuses on the laboratory efficacy and clinical effectiveness of antithrombogenic PICCs to prevent PICC-associated thrombosis, as well as their efficiency and safety. Peripherally inserted central catheters (PICC) are frequently used to deliver medical therapies, but our knowledge regarding PICC-related complications from a patient perspective remains incomplete. The objective of this study was to systematically elicit and characterise PICC-related complications as experienced by patients during and after hospitalisation. Access the full article free of charge here. Central venous catheters (CVC) and peripherally inserted central catheters (PICCs) are central vascular access devices (CVADs) that facilitate administration of medications among critically ill patients. Both are associated with risk of venous thromboembolism (VTE). 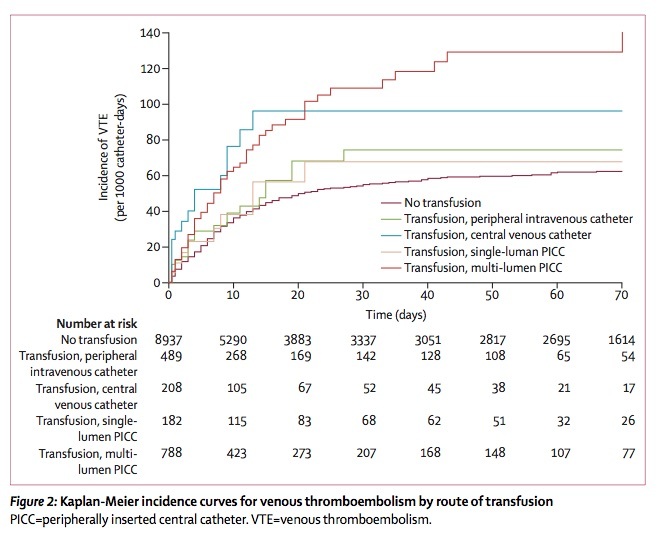 The relative risk of VTE between these catheter types is not well defined. This study compared rates of VTE in patients receiving PICCs, CVCs, or both in a critically ill population. ​The practice of safe and effective enteral nutrition (EN) and parenteral nutrition (PN) support is an important aspect in the abilities of a clinical gastroenterologist. Unfortunately, formal education programs for nutrition training in the course of a gastroenterology fellowship are often lacking. This study examined prevalence and patterns of PICC use in medical ICUs and general medicine wards. The paper sought to describe differences indications, duration of use, complications and outcomes among patients that received PICCs in these settings. Peripherally inserted central catheters (PICCs) are associated with central-line–associated bloodstream infections (CLABSIs). However, no tools to predict risk of PICC-CLABSI have been developed. Central line–associated bloodstream infection (CLABSI) and catheter-associated urinary tract infection (CAUTI) are costly and morbid. Despite evidence-based guidelines, Some intensive care units (ICUs) continue to have elevated infection rates. Peripherally inserted central catheters (PICCs) are associated with upper extremity deep vein thrombosis (DVT). We developed a score to predict risk of PICC-related thrombosis. Peripherally InSerted CEntral catheter dressing and securement in patients with cancer: the PISCES trial. Protocol for a 2x2 factorial, superiority randomised controlled trial. To evaluate patterns and predictors of peripherally inserted central catheter (PICC)–related occlusion. Data from a multihospital study were used to examine factors associated with PICC occlusion. Neonatal intensive care units (NICUs) commonly utilize peripherally inserted central catheters (PICCs) to provide nutrition and long-term medications to premature and full-term infants. However, little is known about PICC practices in these settings. The purpose of this study is to assess PICC practices, policies, and providers in NICUs. While the use of technologies such as ultrasound and electrocardiographic (ECG) guidance systems to place peripherally inserted central catheters (PICCs) has grown, little is known about the clinicians who use these tools or their work settings. Vascular access specialists are increasingly responsible for insertion and care of peripherally inserted central catheters in the United States. Despite proliferation of the specialty, little is known about the training, practice patterns, and experiences of these clinicians. What’s new in skin antisepsis for short-term intravascular catheters: new data to address old problems? Although the incidence of short-term vascular catheter-related infections (CRI) is decreasing, CRI remains a leading cause of healthcare-associated infections (HAI) in intensive care units (ICUs) and the most preventable HAI. During the first week of catheterization, colonization of the catheter from skin pathogens and subsequent infection is the main source for CRI; hence, optimal skin preparation prior to catheter placement and during catheter use is paramount for prevention. To understand the perceived preparedness of frontline nurses (registered nurses (RNs), licensed practical nurses (LPNs), unit nurse managers, and skilled nursing facility (SNF) administrators in providing care for residents with peripherally inserted central catheters (PICCs) in SNFs. Blood is prothrombotic. So too are PICCs. In this analysis, we examined whether the device used for delivery of blood (peripheral IV, central venous catheter, single vs. multi-lumen PICC) influences risk of subsequent thrombosis. In 10,604 patients, 482 (5%) developed VTE. Risk of VTE was greater for patients whose transfusion was given through a multi-lumen PICC than for those who did not receive a transfusion (hazard ratio [HR] 1·96, 95% CI 1·47–2·61; p<0·0001). Compared with delivery through a PIV, VTE risk was not elevated if transfusions were delivered through a single-lumen PICC (HR 0·98, 95% CI 0·44–2·14; p=0·95) or central venous catheter (1·50, 0·77–2·91; p=0·23). For every red blood cell unit transfused through a PICC, a significantly increased risk of venous thromboembolism (adjusted HR 1·24, 95% CI 1·01–1·52; p=0·037) was noted. Risk of VTE with multi-lumen PICCs was not associated with gauge, but with lumens. This abstract presentation is the first to describe how MAGIC can be used to improve the appropriateness of PICC use. This hospital reported a substantial decrease in rates of inappropriate PICC use following implementation. Use of single lumen devices increased substantially while rates of PICC Use <5d dropped. ​ This is the power of MAGIC. This editorial accompanies our manuscript examining the association between PICC use and upper and lower extremity thrombosis in hospitalized medical patients. Peripherally Inserted Central Catheters-Improving Appropriateness With a Dedicated and Rigorous Team- Reply. Reimagining the role of vascular access nurses in the United States - our reply to clinicians in Italy and call for a change in policy and practice. Optimal care of patients with venous thromboembolism requires the input of patient preferences into clinical decision-making. However, the availability and impact of decision aids to facilitate shared decision making in care of venous thromboembolism is not well known. This systematic review and meta-analysis of seven studies (including 1 randomized trial) reports the effect of antimicrobial PICCs on CLABSI. The study finds significant reduction of CHG and minocycline-coated catheters on CLABSI, especially in high-risk populations. Determining appropriateness for vascular access devices limits the risk of complications in critically ill patients. Michigan Appropriateness Guide to Intravenous Catheters (MAGIC) establishes evidence-based indications as summarised in this paper. Patients admitted to acute care frequently require intravenous access to effectively deliver medications and prescribed treatment. For patients with difficult intravenous access, those requiring multiple attempts, those who are obese, or have diabetes or other chronic conditions, determining the vascular access device (VAD) with the lowest risk that best meets the needs of the treatment plan can be confusing. This large secondary data analysis examines patterns and prevalence of PICC use in pneumonia using PREMIER data from 545,150 patients. The analysis finds PICC use is common among younger, but sicker patients. Critical care physicians and geriatricians were most likely to order PICC insertion. Rates of PICC use in pneumonia vary widely across US hospitals, from 0.3 to 41.7%. PICC lumens are known to be associated with infectious and thrombotic risks. However, savings associated with policies that restrict use of multi-lumen PICCs for specific indications are not known. This cost-analysis sheds new light on this question by examining costs related to device acquisition, care/ maintenance and complications between single and multi-lumen PICCs. Many of us draw cultures off PICCs and CVCs, only to realize they are contaminated or clinically irrelevant. Yet decisions such as removing the catheter are often made based on these results. This brief essay describes the problems with the "panculture" approach and provides specific guidance on when microbiological evaluations should be performed. This large prospective cohort study reports indications for use, dwell times and outcomes from 3,378 PICCs placed in 3,201 patients in 10 Michigan hospitals. Significant variation in rationale for PICC placement, patterns of use and risk of various adverse events are reported. This review (written with Prof. Olivier Mimoz in France) describes the state of the art of skin cleaning to prevent catheter infections. We review results of the CLEAN trial which compared 2% CHG/70% alcohol to 5% povidone iodine in ethanol and discuss implications for practice. This survey based study of 140 PICC-trained vascular nurses in 47 Michigan hospitals provides unique insights in the speciality of vascular access nursing, including elements such as practice characteristics, hospital resources, relations with leadership, and certification status. This secondary data analysis of 65,348 patients evaluates whether the Caprini Score is useful to assess VTE risk in medical patients. The analysis found a consistent linear increase in risk in VTE as Caprini Score increased, especially for patients with vascular catheters. This op-ed examines the evidence supporting use of IV devices and how doctors use them. The article calls for greater research in IV devices to improve the quality of decision-making and better engage patients role for when making these decisions. We convened an international panel and applied the RAND/UCLA Appropriateness Method to develop criteria for use of PICCs. Following systematic review of the literature and consensus from a 15-member expert panel, guidelines for use and care of PICCs were developed. Complications associated with central venous catheters (CVCs) increase over time. Although early removal of unnecessary CVCs is important to prevent complications, the extent to which clinicians are aware that their patients have a CVC is unknown. Despite growing use, peripherally inserted central catheters (PICCs) are associated with risk of deep vein thrombosis (DVT). We designed a study to determine patient, provider and device factors associated with this outcome. Growing use of peripherally inserted central catheters (PICCs) has led to recognition of the risk of PICC-associated bloodstream infection. We sought to identify rates, patterns, and patient, provider, and device characteristics associated with this adverse outcome. Peripherally inserted central catheters (PICCs) are associated with an increased risk of venous thromboembolism. However, the size of this risk relative to that associated with other central venous catheters (CVCs) is unknown. We did a systematic review and meta-analysis..
Peripherally inserted central catheters (PICCs) are commonly inserted during hospitalization for a variety of clinical indications. Our objective was to understand hospitalist experience, practice, knowledge, and opinions as they relate to PICCs.